The vehicles were selected based on their suitability for the role and competitive whole-life costs, and join an existing fleet of 21 Volvo V60s. All the NIFRS V60s are converted with bluelight equipment by Volvo’s approved converter network and kitted out with the NIFRS livery. 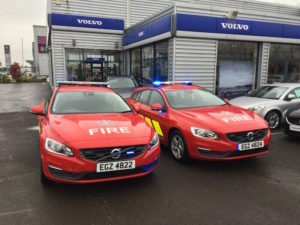 Volvo worked closely with NIFRS to agree on the placement and design of the equipment to suit its requirements working to extremely tight deadlines. Volvo recently revealed its all-new V60, which will debut at next month’s Fleet Show at Silverstone ahead of starting customer deliveries in the autumn.